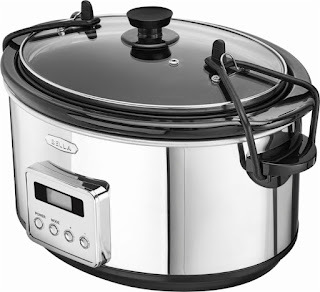 Time for Soups, Chilis, Stews - make sure your pot is big enough with this *HIGHLY RATED* Bella - 5-Quart Slow Cooker ONLY $19.99 (Retail $49.99). Whip up hearty stews with this 5-quart Bella programmable slow cooker. It cooks up to 4 lbs. of roast in one cycle, and its digital timer lets you set cooking times from 30 minutes to 20 hours for different recipes. The locking lid and gasket seals of this Bella programmable slow cooker provide secure, spill-resistant portability.